She’s preparing to welcome her fifth child with musician husband Richard Jones into the world. 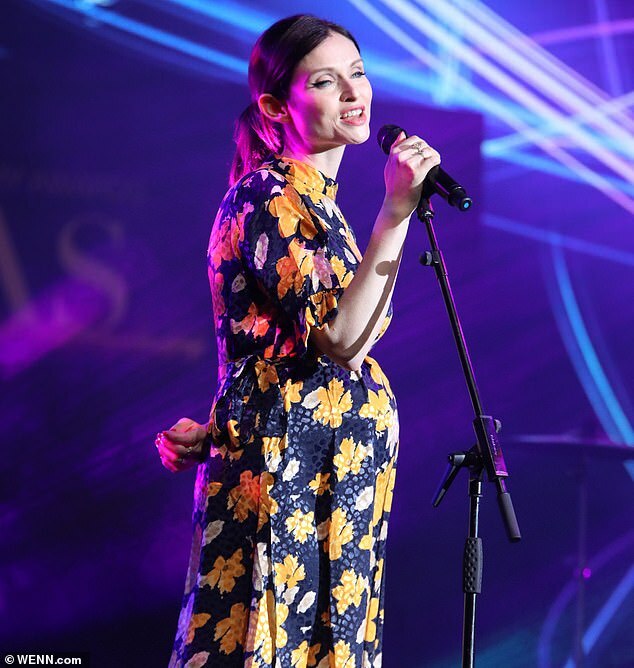 And Sophie Ellis-Bextor showed off her beautiful baby bump as she took to the stage at The Audio and Radio Industry Awards at the First Direct Arena in Leeds on Thursday night. 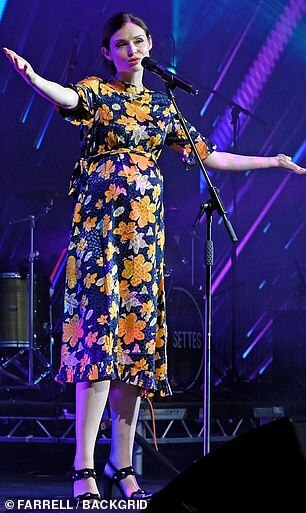 The singer, 39, showed off her shape in a retro-inspired navy and mustard floral midi-dress, featuring a frilled hem and sleeves and an elegant high neckline. The Murder On The Dancefloor hitmaker teamed her pretty frock with black heeled sandals as she put on an energetic performance for the star-studded crowd. The mother-of-four wore her raven locks slicked back from her face, and accentuated her striking features with winged eyeliner and a pink coral lipstick. The musician confirmed she was expecting her fifth child with husband of 13 years, The Feeling rocker Richard Jones, during an appearance on Chris Evans’ BBC Radio 2 breakfast show in August. 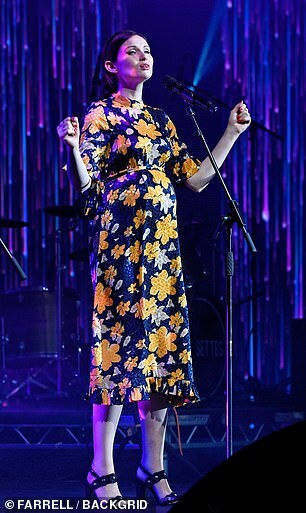 Sophie chose to casually drop her baby bombshell while promoting her new album – describing news of her pregnancy as ‘mental’. 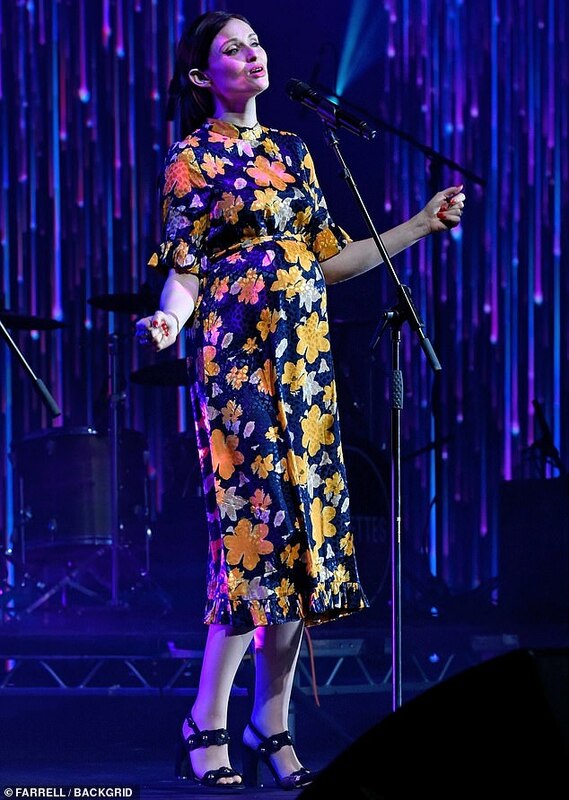 Discussing her new music and its release, Sophie left listeners stunned as she announced her album, The Song Diaries, will be released at the same time she is due to give birth. 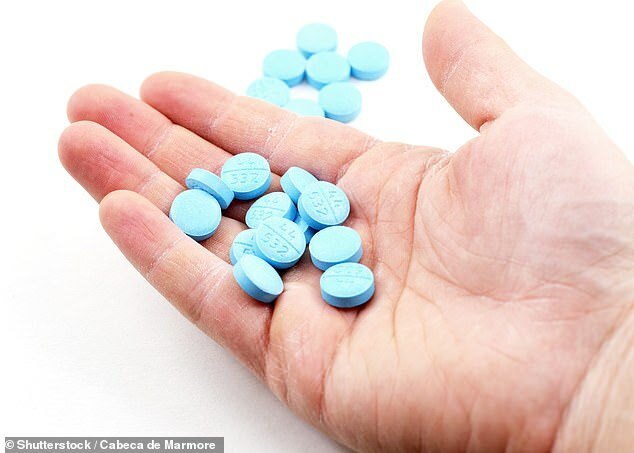 Those in the studio burst out into a round of applause, prompting the former Strictly Come Dancing star to laugh, before claiming she doesn’t yet know whether she’ll be having a boy or a girl. 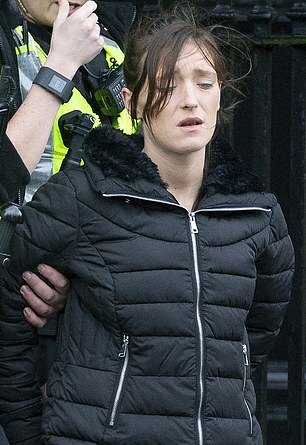 Sophie and her husband are currently parents to four sons; Sonny, 14, Kit, nine, Ray, six, and Jesse, two. She went on to add: ‘You get more relaxed with the chaos. We just went away Richard and I with five kids, because our eldest brought a mate, and I took a book which seemed like the most optimistic thing I could have done! In an interview with The Independent, Sophie has previously stated that she thinks having children has ‘helped her career’ instead of hindering it. She explained: ‘[Motherhood] has made me a better performer, a better artist, a happier person. It’s evolving. For me, it was a massive deal for me to have my kids. It made me think differently about things. The star also said that it has been ‘better’ for her being a mother that works in showbiz compared to in an office, as she has more freedom when it comes to childcare. 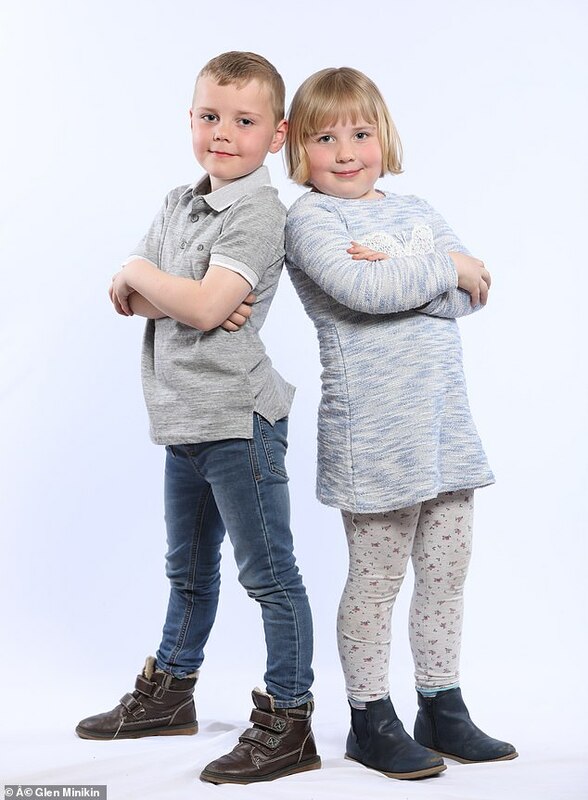 ‘I get to decide which days I work… If you’re doing an office job, you can’t say “Can my kids sit in the corner?” It’s not an option,’ she said – revealing that she has had the help of a full-time nanny to enable her to work. 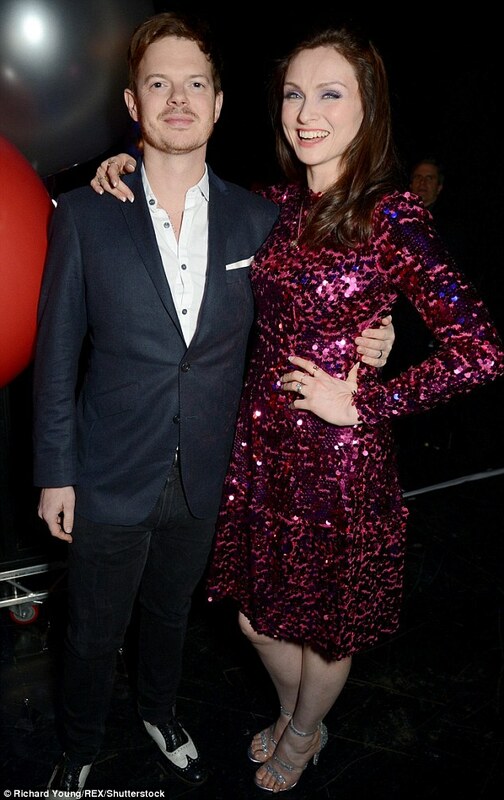 Sophie and Richard have been together since 2002 after meeting in her rehearsal room. She previously said of their romance: ‘Our relationship was dramatic early on. We found out we were having a baby when we’d only been dating for six weeks. The singer revealed her mother, former Blue Peter presenter Janet Ellis, had told her it might feel like the ‘wrong time’, but it’s the ‘right baby’.